There has been a shop on 2/3 Wellington road since the 1800's. Thomas O'Mahony Accountant bought the Grocery Shop in 1899 as a going concern from An Ellen Whelan and his family ran it as well as two other businesses at the St Luke's Cross. The ownership passed from representatives of the O'Mahony family to Margaret Renihan in 1936. Thereafter Sean O'Connor and his family ran and owned the shop until they sold it to the John O'Herlihy and his family in 1978. It was bought by the O'Keeffe family in 1993. 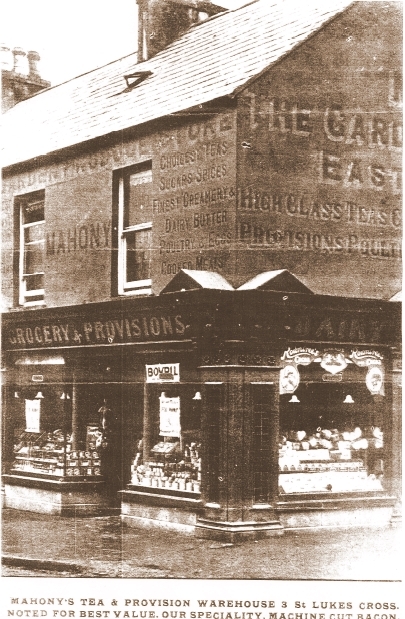 Old picture of the shop at 3 Wellington road, St. Lukes Cross, Cork City.